Since I follow so many people who live on the edge of Apple updates and run the beta all spring and summer, I was comfortable upgrading to iOS 12 right away. 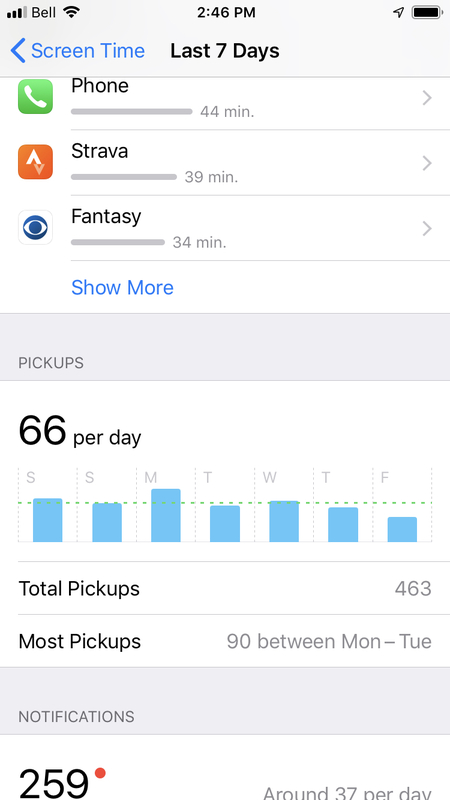 And I’m pretty pleased with the biggest improvement: Screen Time. Not only is this a helpful tool for myself, it’s a great option for parents. There’s a lot of products aiming to help parents to manage what their kids see and how long they’re on screens; Disney’s Circle is a prime example. So it’s not like Apple is far ahead of the curve here. But I have been happy with the implementation of screen time. Alongside the Screen Time settings for my own device, I can see the devices of my kids. We currently have two children out of four with their own phone (one high schooler with a SIM card, one without). 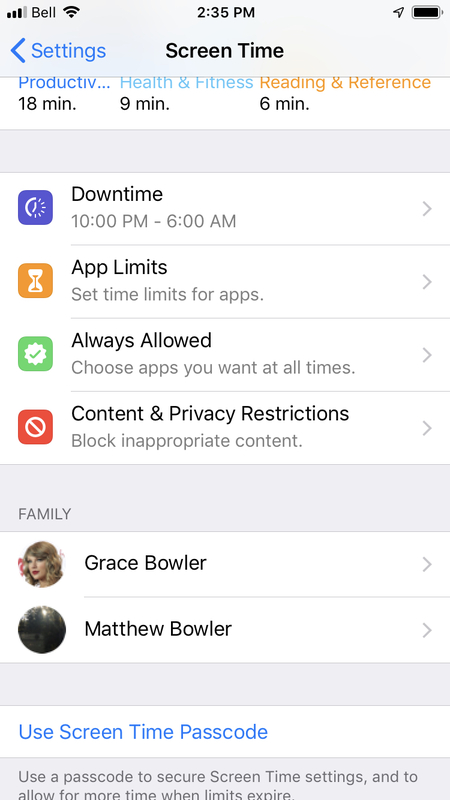 And Screen Time lets us set the same limits and restrictions as on my own phone. So far, we’ve not set many limits. We have a set Downtime for all our devices (I’m down a lot earlier than our t(w)eens). But apart from that, we’ve only set what apps are always allowed. For now, we’re just letting our devices record our activity. Then each Sunday, we’ve decided to sit down as a family and compare our stats. Over time, we’ll decide whether further steps are required. In all our discussions, Erica and I try to emphasize the danger of addiction while also not sounding like we have it figured out. To show how we can struggle in this area ourselves, but without minimizing the behaviour. It’s not an easy line to walk. One thing I have focused on is that I’m not quite as concerned about total time as I am about pickups. One thing I’ve learned from a couple years of using RescueTime (for macOS) is that the days where I feel most frazzled are not necessarily where I spend a lot of time on Twitter or reading blog articles. The problem is constantly switching between activities. You don’t achieve focus or depth when you only stay in one application for less than five minutes at a time. On my phone, this is best indicated by the amount of pickups. So all this is great for awareness. And it’s so nice to have the tools available to enable conversations about this topic with concrete data. Whether or not it brings changes in behavior remains to be seen. But it’s a start.